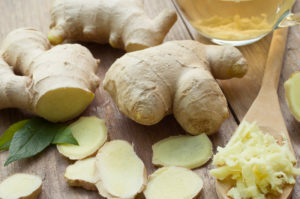 For centuries, ginger root has been used for its medicinal properties by cultures all over the world. The ancient Greeks used it as an aphrodisiac, the Chinese as a tonic for cold and flu symptoms, and the Japanese used it for joint pain. Now we have research that has demonstrated just how powerful ginger can be for our health. Research has shown that ginger is a powerful anti-inflammatory food—inflammation is associated with chronic diseases such as arthritis, cardiovascular disease, diabetes, and obesity. Ginger has also been shown to help relieve symptoms of nausea, hence the popular use of ginger ale to cure an upset tummy. Even more impressive, ginger has antitumorigenic properties that have been shown to be helpful in the treatment of cancers such as breast, colon, and prostate. With all these amazing health benefits, not to mention its amazing flavour, is there anything holding you back from adding ginger to your daily diet? With cold and flu season upon us, this tea might be just what you need. Make this tea when you feel a cold coming on, or when you simply need to warm up your body. In a small pot filled with water, add all the ingredients and bring to a boil, then cover with a lid and let simmer for 20 minutes. The tea will turn a beautiful golden colour. When you are ready to serve, strain the tea with a fine mesh strainer and sweeten with raw honey. Enjoy! Annu Rev Nutr. 2010 Aug 21;30:173-99. doi: 10.1146/annurev.nutr.012809.104755. Targeting inflammation-induced obesity and metabolic diseases by curcumin and other nutraceuticals. J Biomed Biotechnol. 2012;2012:614356. doi: 10.1155/2012/614356. Epub 2012 Aug 26. Differential control of growth, apoptotic activity, and gene expression in human breast cancer cells by extracts derived from medicinal herbs Zingiber officinale. Evid Based Complement Alternat Med. 2012;2012:326096. doi: 10.1155/2012/326096. Epub 2012 Jun 7. 6-Gingerol Inhibits Growth of Colon Cancer Cell LoVo via Induction of G2/M Arrest. Br J Nutr. 2012 Feb;107(4):473-84. doi: 10.1017/S0007114511003308. Epub 2011 Aug 18. Benefits of whole ginger extract in prostate cancer.